Geoffrey Harris is a former official of the European Parliament and currently visiting Professor at the College of Europe in Bruges. Elections for the next European Parliament will take place a year from now. Inside the Brussels/Strasbourg bubble varying degrees of concern and expectation are already palpable. Two months after BREXIT, next May’s elections will take place in a context of explicit challenges to the authority of “Brussels” from many EU Member States with calls for, in effect, the reversal of the integration process. Disruptive electoral forces have had a huge impact on national elections since 2014 and their impact on the next EP is likely to continue this process leading to a different parliamentary context for future EU decisions, not least in relation to selecting the leadership of all the institutions. To some extent the vote next May will be a test of the resilience of the forces of disruption. Will Eurosceptic, populist advances in France, Austria and Italy be maintained? Will the apparently secular decline of social democratic parties seen in France, Germany and Italy as well as in central Europe be stopped or rolled back? Will mainstream centre-right parties currently dominant in Brussels and Strasbourg reverse their losses in those three countries? Will the anti-Brussels governing parties in Hungary in Poland score new election victories? Will President Macron fall victim to electoral disillusionment or will his ambitious ideas and style catch the imagination of voters in other countries as has been the case with his allies in Ciudadanos in Spain? Is democracy in Europe safe? A few years ago, even at the time of the last EP elections of 2014 such a question might have seemed overly dramatic. May 2014 was the first EU parliamentary election held since the ratification of the Lisbon Treaty, which had instituted political and institutional changes ostensibly designed to enhance the democratic legitimacy of the EU. Ironically, neither the expanded powers of the European Parliament, nor its public information slogan of “this time it’s different” succeeded in mobilizing voters and instead, the downward trend in turnout continued with an abstention rate of nearly 58%. What was in fact different last time was the strong showing of radical right and anti-EU parties which gained a record number of seats. Indeed, without their mobilisation of voters the turnout in EP elections would have been even lower than ever. In contrast to media characterizations of the election outcome as a “political earthquake” and a disaster for the European project, the consequences turned out to be less damaging than generally presumed by critics of the purported democratic deficit. President Macron in Strasbourg in April chose dramatic language about the current situation referring to the danger of civil war in Europe. His choice of words was, however, no more controversial than those of the current leaders of Poland and Hungary who openly defend the practice of illiberal democracy. The new Government in Italy seems likely to base its fragile unity on rejection of “interference” from Brussels. The readiness of the current EU leadership to confront these challenges will be tested in the run-up to the EP elections. Will member states face down those opposing the rule of law linkage proposed in the MFF? Will the Commission press on with legal action on Poland? Will the EP concerns on Hungary finally be acted upon? Will the EPP choice for Commission President take up these concerns or merely echo the emollient language of Joseph Daul and Manfred Weber? If they are to recover enough credibility to challenge the right the Socialists in the EP also have to act upon concerns about the rule of law in Romania, Malta and Slovakia where their parties are in power. Will the EU be able to function after May 2019? In fact, around 30% of seats in the current legislature went to various anti-EU or Eurosceptic parties. This did not, however, lead to a breakdown in the functioning of the EU in general or the European Parliament in particular. Concerns that “business as usual” will be difficult a year from now may be seen in the sense of urgency around the Commission proposal for the post-Brexit long-term EU budget. This has to be agreed by the EP and (unanimously) by the member states. The initial proposal is proving very controversial on many fronts ranging from cuts in CAP spending to conditionality of EU financial assistance in relation to respect for the rule of law. Politely described by Hungary as “blackmail” its chances of rapid adoption seem limited. Some observers already fear an Italian scenario where in national elections in March a pro-European consensus which had lasted for nearly 70 years effectively evaporated. The end of consensus politics. The real difference now is that the end of the pro-EU consensus in many member states is leading to a blurring of the lines between the mainstream and the far right. When in 1984 Jean-Marie Le Pen scored an electoral breakthrough in the EP elections he was faced by an effective cordon sanitaire effectively marginalising him and his allies in Brussels and Strasbourg. In January 1986 the EP adopted (286 votes to 1) a report on the rise of racism and fascism in Europe. Parliament established an initial consensus that such parties had to be confronted and, in the decades, since then the EU has taken legislative action to confront both racism and xenophobia. Article 7 of the Lisbon Treaty may be seen as part of the ongoing efforts to equip the EU to confront extremism and threats to democracy. Debates on such subjects in the EP are, however, no longer consensual. The cordon sanitaire no longer exists. In Austria the party from Marine Le Pen’s EP Group is in the Government. In Italy her ally is in a very strong position precisely because it went into the recent election in alliance with an EPP Party Forza Italia the party of Mr Berlusconi and current EP President Tajani. The winning party in the recent Italian election works together with UKIP in a separate explicitly Eurosceptic group. Marine Le Pen has been encouraging Orbán to take his party out of the EPP and join hers. Apparently not terrible enough to restrain the respected and experienced EPP Party Chair from wishing Orbán good luck in advance of his election. So, when the EP reconvenes after next May’s elections the chances of effective cooperation between the main EP Groups may be more limited than in 2014. For the moment all continue to insist on respecting the Spitzenkandidaten process but with threats to the basic values of the EU apparent even within both the main groups it is far from clear how this will work in practice. Indeed, the friendly debates between Juncker and Schulz in 2014 reflected the integrationist consensus which is being so openly challenged across the continent. Within hours of the 2014 EP election results being known the runner-up Martin Schulz and his party allies plumped for a grand coalition but as perceived by former EP Secretary General, Julian Priestley and his co-author (The Making of a European President, Palgrave 2015), the socialists found themselves locked into a parliamentary majority, but with the perception that their influence is negligible and incapable of mobilising their supporters in 2019. As that parliamentary coalition does not currently exist the outlook is even more uncertain. Right Moving right and left moving left? Part of the reason that the social democrats look with concern to the next election is that they also fear that as in France, Greece and the Netherlands they could lose out to left-wing parties calling for a change of course on management of the Eurozone. Meanwhile, some analysts consider that the EPP leaders’ response to developments in central Europe will lead, in fact, to an Orbánization of the EPP. 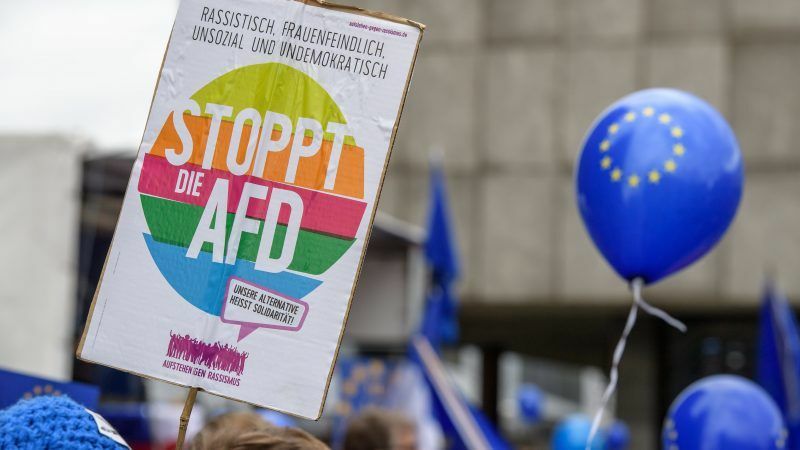 Without explicitly adopting the language of Euroscepticism it does appear that party leaders like Laurent Wauquiez in France and Horst Seehofer in Germany are ready to adopt some of the language and anti-Brussels rhetoric of identity politics. As immigration and the future of Schengen could be big issues in the 2019 EP elections it seems that such leaders consider that their approach is the smart way of recouping electoral losses to the far right. The danger is, however, that their rivals on the right can see them coming. On 1 May Marine Le Pen who is counting on an electoral success next May brought together he European allies in Marseilles. Like those on the far left, her message is no longer about leaving the Euro let alone FREXIT but is now about being for Europe but against Brussels and certainly against the further integration being championed by President Macron her 2017 nemesis. Her language is hardly very different from that of Wauquiez who describes the EU as a rêve perdu. Indeed, already in 2014, he was writing about France exiting Schengen. It remains to be seen if the Commission will find a diplomatic solution to the overt challenge to EU values emerging in Hungary and Poland. This, in effect, blunts the impact of position adopted by the European Parliament which is precisely why the anti-Brussels revolutionaries in power in Warsaw and Budapest are ready to negotiate whilst rejecting (along with others) the values element in the MFF which, anyway, will not be effective until well after the next EP elections. For too long the mainstream parties at EU level ignored the Eurosceptics, assuming that what is marginal, as the far right was in the 1980s, is also insignificant. Instead it would have been wiser to reflect upon what the “anti-system” forces had to say. Assuming that political issues could be overcome merely by better non-political communication on behalf of the system has proved naive. Hans-Gert Pottering led the efforts leading to the EPP becoming the strongest group in the EP after 1999. He considered that there was nothing inevitable about the situation in which since 1979 “the EPP Group had always played second fiddle to the Socialist Group in Parliament.” At the time British Conservatives were part of the EPP group but as President Pottering explains in his fascinating autobiography (United for the Better-My European Way John Harper 2016) it was the integration of the mainstream right parties from France and Italy which really changed things. The change in the power balance did not, however, undermine the ability of the two main groups to cooperate to advance the interests of the institutions and to ensure the continuing integration process. With so many EPP parties now ready to work at national and indeed local level with far-right parties it is very hard to see such a consensus re-emerging any time soon. So once the dust settles on the post BREXIT EU and as the Union tries to face down the aggressive approaches from Moscow and Washington Europe’s voters will be decoding whether BREXIT has brought about a miraculously more united Europe or whether that first disruptive event was just an ice-breaker, the beginning of an era of disruption.